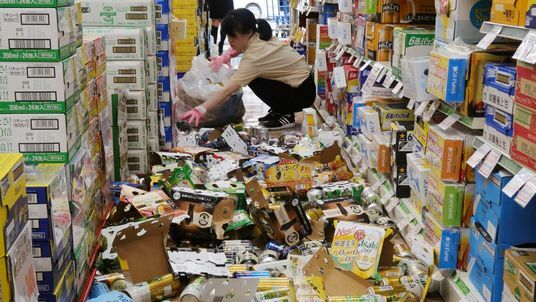 A nine-year-old girl is among three people to have died following a 6.1 magnitude earthquake in and around the Japanese city of Osaka. Officials confirmed the death toll, which includes two men in their 80s, after the area was hit shortly after 8am local time (midnight in the UK) on Monday. The girl was knocked down by a concrete wall at her primary school as she walked by. One of the men was also killed by a collapsed wall in the city. The other victim - an 84-year-old man - died in nearby Ibaraki after a bookshelf fell on him at his home. The quake caused water mains to burst, walls to topple and a number of fires to break out, with more than 300 people reported to have been injured. According to the Japan Meteorological Agency, the tremor was at its strongest just north of Osaka, with an initial recording of 5.9 at a depth of 13km. It disrupted the morning commute for thousands of people, including those outside the city, with bullet train and subway services suspended while they were checked for damage.